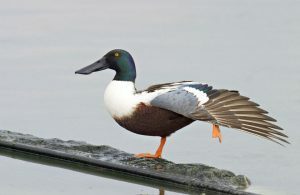 The Northern Shovelor is a well known and widespread duck. These elegant ducks are also popular as Shovelor, mainly seen in the northern areas of Asia as well as Europe. Sometimes hunters refer to these species as the “spoony”. They are being named so because of their large spoon shaped bill. This is the only species to which the AEWA (Agreement on the Conservation of African-Eurasian Migratory Waterbirds) applies. Northern Shoveler looks like the description given below. Length : These ducks grows to a height of 14 inches. Weight : Shovelers weigh between 400 and 700gm. Bill : Sholevers are popular worldwide for their large spatulate bill. Feathers : They usually have light blue forewing feathers. 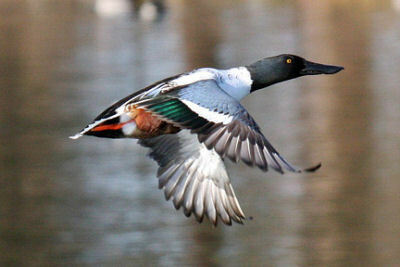 Color : Shovelers are iridescent green colored. They also come in white, chestnut and brown color. Wingspan : Their wingspan stretches upto 20-30 inches. Their distribution range is wide. During the breeding season they are seen in North America, Asia and Europe. Apart from that they flutter around in South America, Southern Asia, North Africa, New Mexico, Illinois and Indian Subcontinent. Shovelers prefer residing on open wetlands that includes wet grasslands as well as marshes having budding vegetation. They are often seen in the freshwater lakes, industrial cooling ponds, coastal lagoons, estuaries, and mangrove swamps. These ducks are filter feeder. They eat food by their long bill. They feed on plankton, water insects, etc. They prefer eating aquatic plants, mollusks and several types of water insects. Basically, they tend to forage on water bodies that are rich in plant diversity. Shovelors also feed on animals such as fingernails clams, copepods and midge. Shovelers make use of their bills to strain food from water. They prefer nesting in grassy areas. Drakes are territorial during their breeding season. They engage themselves in elaborate courtship behavior. They are always seen swimming and playing in the freshwater lakes. While feeding, these ducks are seen in groups. They are also seen dabbing in shallow ponds. Northern Shovelors are often attacked by red fox, cats, dogs, weasels, martens and sometimes even by raccoons. They often poop on their eggs to dissuade predators. Their bills allow them to strain food from water. Shovelers bills are adapted for their mode of feeding. 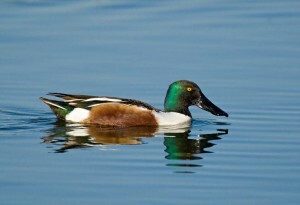 Northern shovelers are good swimmers, which is one of their greatest advantage and adaptive feature. This species mainly follows an annual migration. Their annual migration consists of 2 periods – spring migration and fall migration. Majority of shovelers migrates from their wintering grounds late march and arrive at their breeding grounds late April or mid of May. Shovelers migrate in the small isolated flocks comprising of 10-15 individuals. Males migrate much before than the females. They make a rattling noise when they take a flight. Their usual flight pattern is steady and direct. When startled, the smaller ones twist and turn in the air like teal. The males have a clunking call, on the other hand females have a call similar to that of the Mallard. Their breeding season starts from the end of August or early September. Northern shovelers are monogamous. Shovelers start breeding on grounds when they are free of ice. They build their nest on dry ground in short vegetation. Female Shovelers lay 8 to 12 eggs in the nests that last for 20-25 days and are incubated by the females. 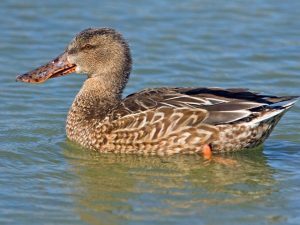 Female Shovelers hatch in about three weeks. After the female begins with incubation, the pair bond liquefies. Soon after hatching, the female Shovelers lead the ducklings to the ponds and teach them how to swim, how to catch insects and also how to find plants to eat. The ducklings start fledging in 40 to 70 days. 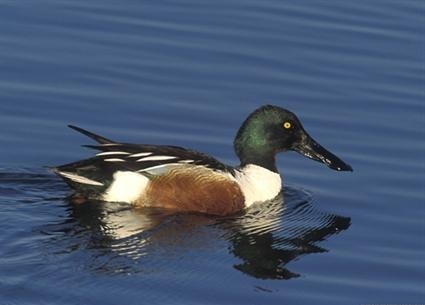 Northern Shovelers live up to 2-3 years and not more than that. These beautiful and graceful shovelers can be held in captivity with the other waterfowl species. Shovelers are playful in nature but when disturbed can harm you with their long and stretched bills. IUCN has enlisted these species of ducks in the least concerned category. Their population is decreasing and the largest factor behind it is the degradation of nesting grounds. Changes in climate have also affected their population. Find out some very interesting facts about these birds here. Northern shovelers are quite widespread. 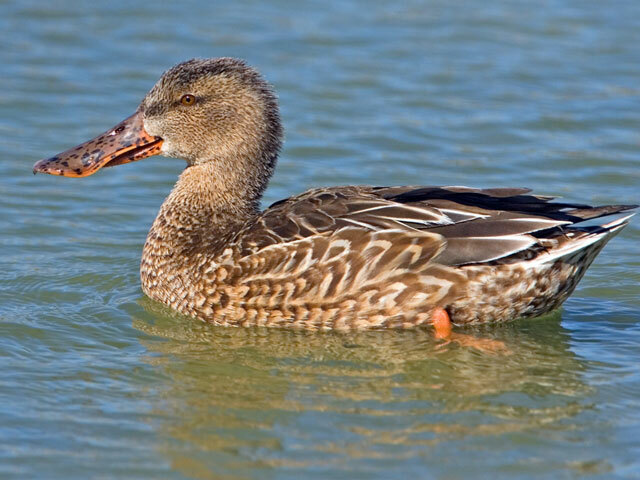 There are three other species of shovelers – Cape, Australasian, and Red Shoveler. When the birds take off, their wings make a rattling noise. They are undoubtedly one of cutest and adorable birds. They are prey for any devoted hunter. Here are a few images of the graceful Northern Shoveler ducks.